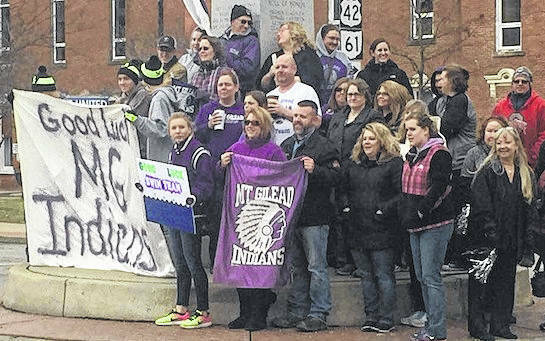 Supporters of Mount Gilead High School swim team gathered for a sendoff on the square Friday morning. The team is headed to Athens for Division II district competition this afternoon. https://www.morrowcountysentinel.com/wp-content/uploads/sites/29/2018/02/web1_27858470_10209356743470688_8899812336179539970_n.jpgSupporters of Mount Gilead High School swim team gathered for a sendoff on the square Friday morning. The team is headed to Athens for Division II district competition this afternoon.